Areas included within the Appalachian Regional Commission's charter. Appalachia is a term used to describe a cultural region in the eastern United States that stretches from the Southern Tier of New York state to northern Alabama, Mississippi, and Georgia. While the Appalachian Mountains stretch from Belle Isle in Canada to Cheaha Mountain in the U.S. state of Alabama, the cultural region of Appalachia typically refers only to the central and southern portions of the range. As of 2005, the region was home to approximately 23 million people. While endowed with abundant natural resources, Appalachia has long struggled with poverty. In the early 20th century, large-scale logging and coal mining firms brought wage-paying jobs and modern amenities to Appalachia, but by the 1960s the region had failed to capitalize on any long-term benefits from these two industries. Beginning in the 1930s, the federal government sought to alleviate poverty in the Appalachian region with a series of New Deal initiatives, such as the construction of dams to provide cheap electricity and the implementation of better farming practices. In 1965, the Appalachian Regional Commission was created to further alleviate poverty in the region, mainly by diversifying the region's economy and helping to provide better health care and educational opportunities to the region's inhabitants. By 1990, Appalachia had largely joined the economic mainstream, but still lagged behind the rest of the nation in most economic indicators. Since Appalachia lacks definite physiographical or topographical boundaries, there has been some disagreement over what exactly the region encompasses. The most commonly used modern definition of Appalachia is the one initially defined by the Appalachian Regional Commission in 1965 and expanded over subsequent decades. The region defined by the Commission currently includes 420 counties and eight independent cities in 13 states, including all of West Virginia and 14 counties in New York, 52 in Pennsylvania, 32 in Ohio, 3 in Maryland, 54 in Kentucky, 25 counties and 8 cities in Virginia, 29 in North Carolina, 52 in Tennessee, 6 in South Carolina, 37 in Georgia, 37 in Alabama, and 24 in Mississippi. When the Commission was established, counties were added based on economic need, however, rather than any cultural parameters. The first major attempt to map Appalachia as a distinctive cultural region came in the 1890s with the efforts of Berea College president William Goodell Frost, whose "Appalachian America" included 194 counties in eight states. In 1921, John C. Campbell published The Southern Highlander and His Homeland in which he modified Frost's map to include 254 counties in 9 states. A landmark survey of the region in the following decade by the United States Department of Agriculture defined the region as consisting of 206 counties in 6 states. In 1984, Karl Raitz and Richard Ulack expanded the ARC's definition to include 445 counties in 13 states, although they removed all counties in Mississippi and added two in New Jersey. Historian John Alexander Williams, in his 2002 book Appalachia: A History, distinguished between a "core" Appalachian region consisting of 164 counties in West Virginia, Kentucky, Virginia, Tennessee, North Carolina, and Georgia, and a greater region defined by the ARC. 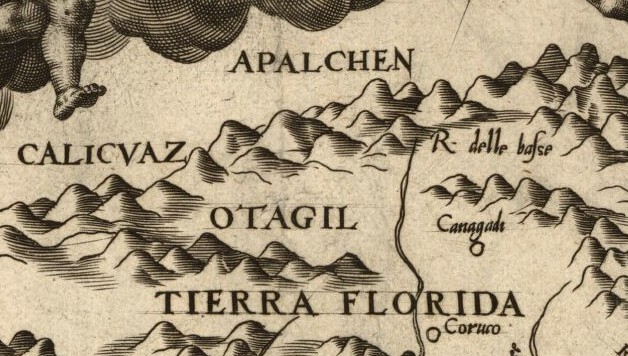 While exploring inland along the northern coast of Florida in 1528, the members of the Narváez expedition, including Álvar Núñez Cabeza de Vaca, found a Native American village near present-day Tallahassee, Florida whose name they transcribed as Apalchen or Apalachen [a.paˈla.tʃen]. The name was soon altered by the Spanish to Apalachee and used as a name for the tribe and region spreading well inland to the north. Pánfilo de Narváez's expedition first entered Apalachee territory on June 15, 1528 and applied the name. Now spelled "Appalachian", it is the fourth oldest surviving European place-name in the U.S. After the de Soto expedition in 1540, Spanish cartographers began to apply the name of the tribe to the mountains themselves. The first cartographic appearance of Apalchen is on Diego Gutierrez' map of 1562; the first use for the mountain range is the map of Jacques le Moyne de Morgues in 1565. Native American hunter-gatherers first arrived in what is now Appalachia over 12,000 years ago. Several Archaic period (8000-1000 B.C.) archaeological sites have been identified in the region, such as the St. Albans site in West Virginia and the Icehouse Bottom site in Tennessee. In the 16th century, the de Soto and Juan Pardo expeditions explored the mountains of South Carolina, North Carolina, Tennessee, and Georgia, and encountered complex agrarian societies populated by Muskogean-speaking inhabitants. De Soto indicated that much of the region west of the mountains was part of the domain of Coosa, a paramount chiefdom centered around a village complex in northern Georgia. By the time English explorers arrived in Appalachia in the late 17th century, the central part of the region was controlled by Algonquian tribes (namely the Shawnee) and the southern part of the region was controlled by the Cherokee. European migration into Appalachia began in the 18th century. As lands in eastern Pennsylvania and the tidewater areas of Virginia and the Carolinas filled up, immigrants began pushing further and further westward into the Appalachian Mountains. A relatively large proportion of the early backcountry immigrants were Ulster Scots— later known as "Scotch-Irish"— who were seeking cheaper land and freedom from Quaker leaders, many of whom considered the Scotch-Irish "savages." Others included Germans from the Palatinate region and English settlers from the Anglo-Scottish border country. Between 1730 and 1763, immigrants trickled into Western Pennsylvania, Northwestern Virginia, and Western Maryland. Thomas Walker's discovery of Cumberland Gap in 1750 and the end of the French and Indian War in 1763 lured settlers deeper into the mountains, namely to upper East Tennessee, Northwestern North Carolina, Upstate South Carolina, and Central Kentucky. Between 1790 and 1840, a series of treaties with the Cherokee and other Native American tribes opened up lands in North Georgia, Northeast Alabama, the Tennessee Valley, the Cumberland Plateau regions, and the highlands along what is now the Tennessee-North Carolina border. The last of these treaties culminated in the removal of the bulk of the Cherokee population from the region via the Trail of Tears in 1838. Appalachian frontiersmen have long been romanticized for their ruggedness and self-sufficiency. A typical depiction of an Appalachian pioneer involves a hunter wearing a coonskin cap and buckskin clothing, and sporting a long rifle and shoulder-strapped powder horn. Perhaps no single figure symbolizes the Appalachian pioneer more than Daniel Boone (1734–1820), a long hunter and surveyor instrumental in the early settlement of Kentucky and Tennessee. Like Boone, Appalachian pioneers moved into areas largely separated from "civilization" by high mountain ridges, and had to fend for themselves against the elements. As many of these early settlers were living illegally on Native American lands, attacks from Native American tribes were a continuous threat until the 19th century. As early as the 18th century, Appalachia (then known simply as the "backcountry") began to distinguish itself from its wealthier lowland and coastal neighbors to the east. Frontiersmen often bickered with lowland and tidewater "elites" over taxes, sometimes to the point of armed revolts such as the Regulator Movement (1767–1771) in North Carolina. 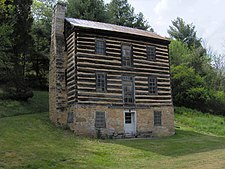 In 1778, at the height of the American Revolution, backwoodsmen from Pennsylvania, Virginia, and what is now Kentucky took part in George Rogers Clark's Illinois campaign. Two years later, a group of Appalachian frontiersmen known as the Overmountain Men routed British forces at the Battle of Kings Mountain after rejecting a call by the British to disarm. After the war, residents throughout the Appalachian backcountry— especially the Monongahela region in Western Pennsylvania and northwestern Virginia— refused to pay a tax placed on whiskey by the new American government, leading to what became known as the Whiskey Rebellion. In the early 19th century, the rift between the yeoman farmers of Appalachia and their wealthier lowland counterparts continued to grow, especially as the latter dominated most state legislatures. People in Appalachia began to feel slighted over what they considered unfair taxation methods and lack of state funding for improvements (especially for roads). In the northern half of the region, the lowland "elites" consisted largely of industrial and business interests, whereas in the parts of the region south of the Mason-Dixon Line, the lowland elites consisted of large-scale land-owning planters. The Whig Party, formed in the 1830s, drew widespread support from disaffected Appalachians. By 1860, the Whig Party had disintegrated. Sentiments in northern Appalachia had shifted to the pro-abolitionist Republican Party. In southern Appalachia, abolitionists still constituted a radical minority, although several smaller opposition parties (most of which were both pro-Union and pro-slavery) were formed to oppose the planter-dominated Southern Democrats. As states in the southern United States moved toward secession, a majority of Southern Appalachians still supported the Union. In 1861, a Minnesota newspaper identified 161 counties in Southern Appalachia— which the paper called "Alleghenia"— where Union support remained strong, and which might provide crucial support for the defeat of the Confederacy. However, many of these Unionists— especially in the mountain areas of North Carolina, Georgia, and Alabama— were "conditional" Unionists in that they opposed secession, but also opposed violence to prevent secession, and thus when their respective state legislatures voted to secede, their support shifted to the Confederacy. Kentucky sought to remain neutral at the outset of the conflict, opting not to supply troops to either side. After Virginia voted to secede, several mountain counties in northwestern Virginia rejected the ordinance and with the help of the Union army established a separate state, admitted to the Union as West Virginia in 1863. However, half the counties included in the new state, comprising two-thirds of its territory, were secessionist and pro-Confederate. This caused great difficulty for the new Unionist state government in Wheeling, both during and after the war. A similar effort occurred in East Tennessee, but the initiative failed after Tennessee's governor ordered the Confederate army to occupy the region, forcing East Tennessee's Unionists to flee to the north or go into hiding. Both central and southern Appalachia suffered tremendous violence and turmoil during the U.S. Civil War. While there were two major theaters of operation in the region— namely the Shenandoah Valley of Virginia (and present day West Virginia) and the Chattanooga area along the Tennessee-Georgia border— much of the violence was caused by bushwhackers and guerrilla war. Large numbers of livestock were killed (grazing was an important part of Appalachia's economy), and numerous farms were destroyed, pillaged, or neglected. The actions of both Union and Confederate armies left many inhabitants in the region resentful of government authority and suspicious of outsiders for decades after the war. After the war, northern parts of Appalachia experienced an economic boom, while economies in the southern parts of the region stagnated, especially as Southern Democrats regained control of their respective state legislatures at the end of Reconstruction. Pittsburgh and its surrounding areas in Western Pennsylvania grew into one of the nation's major industrial centers, especially regarding iron and steel production. By 1900, the Chattanooga area and North Georgia and Northern Alabama had experienced similar changes due to manufacturing booms in Atlanta and Birmingham at the edge of the Appalachian region. 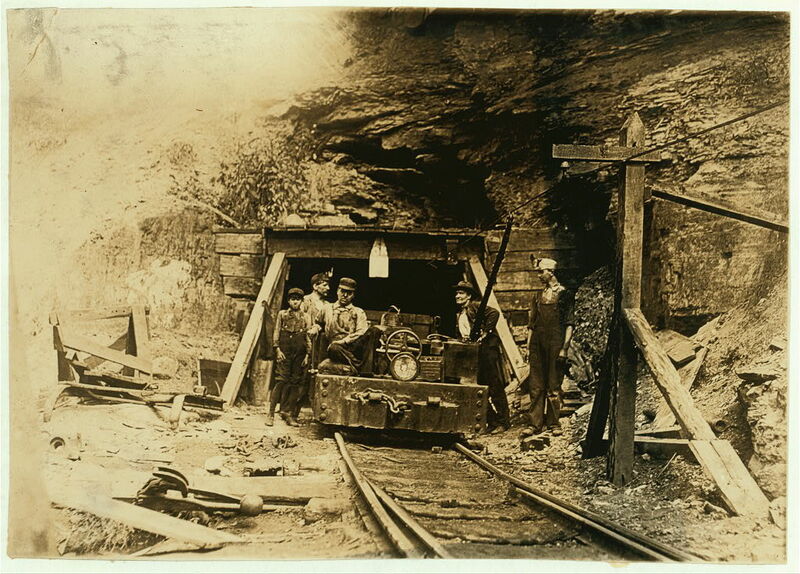 Railroad construction between the 1880s and early 20th century gave the greater nation access to the vast coalfields in central Appalachia, making the economy in that part of the region practically synonymous with coal mining. 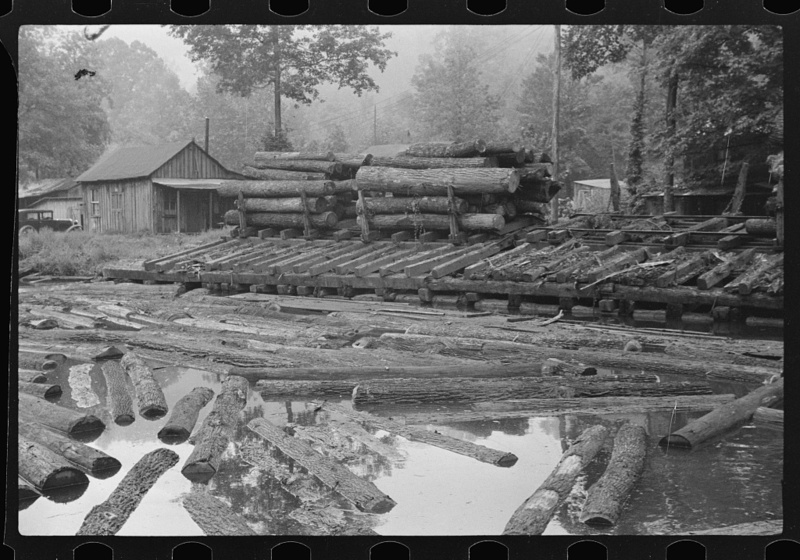 As the nationwide demand for timber skyrocketed, lumber firms turned to the virgin forests of Southern Appalachia, using sawmill and logging railroad innovations to reach remote timber stands. 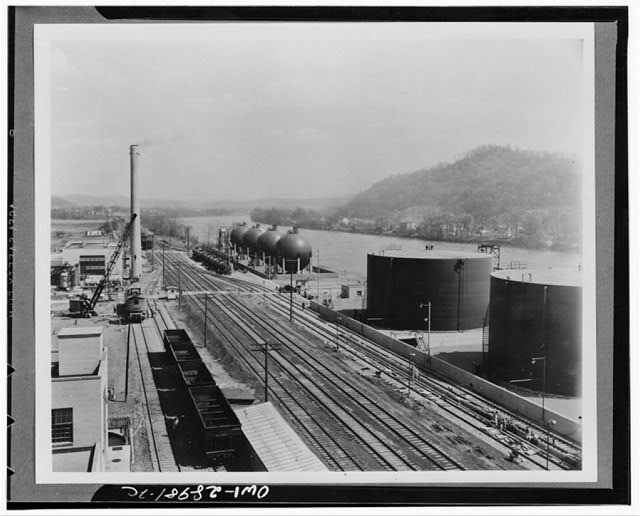 The Tri-Cities area of Tennessee and Virginia and the Kanawha Valley of West Virginia became major petrochemical production centers. The late 19th and early 20th centuries also saw the development of various regional stereotypes. Attempts by President Rutherford B. Hayes to enforce the whiskey tax in the late 1870s led to an explosion in violence between Appalachian "moonshiners" and federal "revenuers" that lasted through the Prohibition period in the 1920s. The breakdown of authority and law enforcement during the Civil War may have contributed to an increase in clan feuding, which by the 1880s was reported to be a problem across most of Kentucky's Cumberland region as well as Carter County in Tennessee, Carroll County in Virginia, and Mingo and Logan counties in West Virginia. Regional writers from this period such as Mary Noailles Murfree and Horace Kephart liked to focus on such sensational aspects of mountain culture, leading readers outside the region to believe they were more widespread than in reality. In an 1899 article in Atlantic, Berea president William G. Frost attempted to redefine the inhabitants of Appalachia as "noble mountaineers"— relics of the nation's pioneer period whose isolation had left them unaffected by modern times. Logging firms' rapid devastation of the forests of Southern Appalachia sparked a movement among conservationists to preserve what remained and allow the land to "heal." In 1911, Congress passed the Weeks Act, giving the federal government authority to create national forests and control timber harvesting. Regional writers and business interests led a movement to create national parks in the eastern United States similar to Yosemite and Yellowstone in the west, culminating in the creation of the Great Smoky Mountains National Park in Tennessee and North Carolina, Shenandoah National Park in Virginia, and the Blue Ridge Parkway (connecting the two) in the 1930s. During the same period, New England forester Benton MacKaye led the movement to build the 2,175-mile (3,500 km) Appalachian Trail, which stretches from Georgia to Maine and extends into Canada. 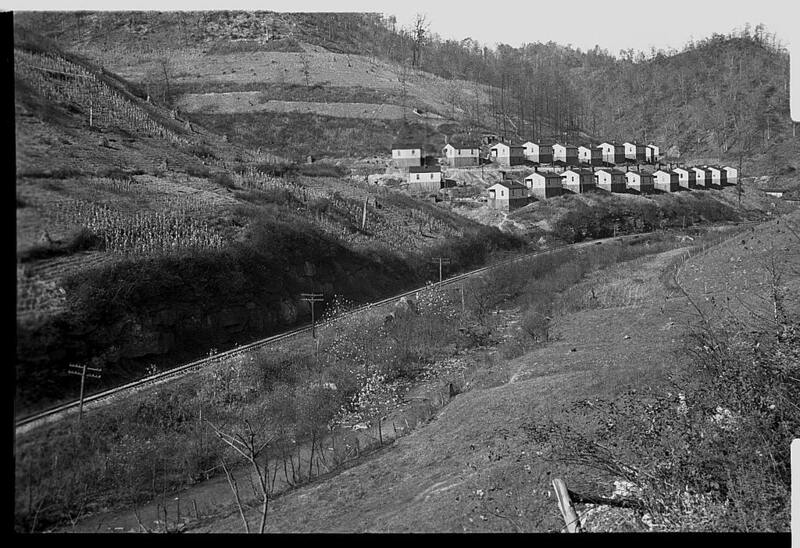 By the 1950s, poor farming techniques and the loss of jobs to mechanization in the mining industry had left much of Central and Southern Appalachia poverty-stricken. The lack of jobs also led to widespread difficulties with outmigration. Beginning in the 1930s, federal agencies such as the Tennessee Valley Authority began investing in the Appalachian region. Sociologists such as James Brown and Cratis Williams and authors such as Harry Caudill and Michael Harrington brought attention to region's plight in the 1960s, prompting Congress to create the Appalachian Regional Commission in 1965. The commission's efforts helped to stem the tide of outmigration and diversify the region's economies. Although there have been drastic improvements in the region's economic conditions since the commission's founding, the ARC still listed 82 counties as "distressed" in 2010, with nearly half of them (40) in Kentucky. Germans were a major pioneer group to migrate to Appalachia, settling mainly in the northern part of the region in Western Pennsylvania, although some were part of the initial wave of migrants to the southern mountains. In the 19th century, Welsh immigrants were brought into the region for their mining and metallurgical expertise, and by 1900 over 100,000 Welsh immigrants were living in Western Pennsylvania alone. Thousands of German-speaking Swiss migrated to Appalachia in the second half of the 19th century, and their descendants remain in places such as East Bernstadt, Kentucky and Gruetli-Laager, Tennessee. The coal mining and manufacturing boom in the late-19th and early-20th centuries brought large numbers of Italians and Eastern Europeans to Appalachia, although most of these families left the region when the Great Depression shattered the economy in the 1930s. African-Americans have been present in the region since the 18th century, and currently make up 8% of the ARC-designated region, mostly concentrated in urban areas and former mining and manufacturing towns. Native Americans, the region's original inhabitants, are only a small percentage of the region's present population, their most notable concentration being the reservation of the Eastern Band of Cherokee Indians in North Carolina. The Melungeons, a group of mixed African, European, and Native American ancestry, are scattered across northeastern Tennessee, eastern Kentucky, and southwestern Virginia. Religion has long been one of the most powerful forces in Appalachia. Religion in Appalachia is characterized by a sense of independence and a distrust of religious hierarchies, both rooted in the evangelical tendencies of the region's pioneers, many of whom had been influenced by the "New Light" movement in England. Many of the religions brought from Europe underwent modifications or factioning during the Second Great Awakening (especially the Holiness movement) in the early 19th century. 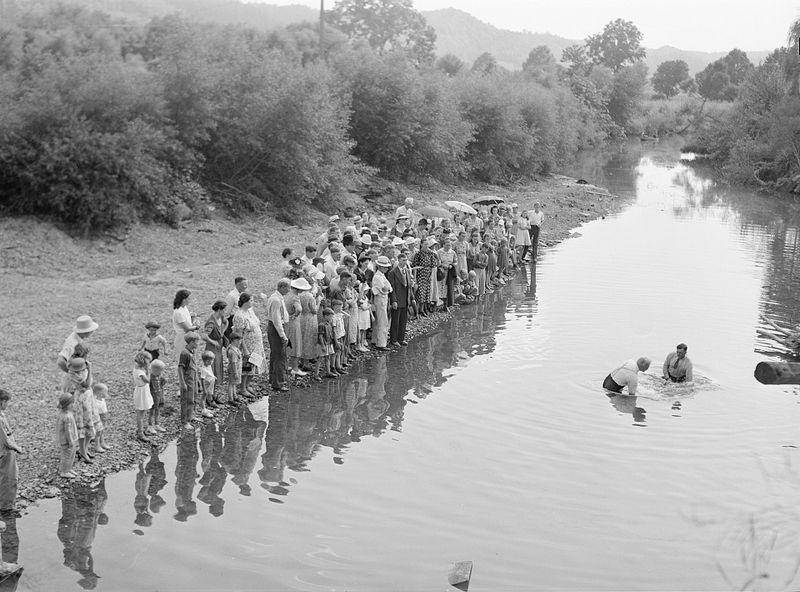 A number of 18th and 19th-century religious traditions are still practiced in parts of Appalachia, including natural water (or "creek") baptism, rhythmically chanted preaching, congregational shouting, and foot washing. While most church-goers in Appalachia attend fairly well organized churches affiliated with regional or national bodies, small unaffiliated congregations are not uncommon in rural mountain areas. Christian Protestantism is the most dominant religious force in Appalachia, although there is a significant Catholic presence in the northern half of the region and in urban areas. The region's early Lowland and Ulster Scot immigrants brought Presbyterianism to Appalachia, eventually organizing into bodies such as the Cumberland Presbyterian Church. 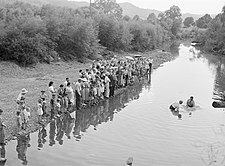 English Baptists— most of whom had been influenced by the Separate Baptist and Regular Baptist movements— were also common on the Appalachian frontier, and today are represented in the region by groups such as the Free Will Baptists, the Southern Baptists, Missionary Baptists, and "old-time" groups such as the United Baptists and Primitive Baptists. Circuit riders such as Francis Asbury helped spread Methodism to Appalachia in the early 19th century, and today 9.2% of the region's population is Methodist, represented by such bodies as the United Methodist Church, the Free Methodist Church, and the African Methodist Episcopal Zion Church. Major Pentecostal movements within the region include the Church of God (based in Cleveland, Tennessee) and the Assemblies of God. Scattered Mennonite colonies exist throughout the region. The Appalachian dialect is a dialect of Midland American English known as the Southern Midland dialect, and is spoken primarily in Central and Southern Appalachia. The Northern Midland dialect is spoken in the northern parts of the region, while Pittsburgh English (more commonly known as "Pittsburghese") is strongly influenced by Appalachian dialect. The Southern Appalachian dialect is considered part of the Southern American dialect although the two are distinguished by the rhotic nature of the Appalachian dialect. Early 20th-century writers believed the Appalachian dialect to be a surviving relic of Old World Scottish or Elizabethan dialects. Recent research suggests, however, that while the dialect has a stronger Scottish influence than other American dialects, most of its distinguishing characteristics are American in origin. In the 20th century, national trends began to have more of an effect on education in Appalachia, sometimes clashing with the region's traditional values. The Scopes Trial— the nation's most publicized debate over the teaching of the Theory of Evolution— took place in Dayton, Tennessee in Southern Appalachia in 1925. In spite of consolidation and centralization, schools in Appalachia struggled to keep up with federal and state demands into the 21st century. Since 2001, a number of the region's public schools were threatened with loss of funding due to difficulties fulfilling the demands of No Child Left Behind. Appalachian music is one of the most well-known manifestations of Appalachian culture. Traditional Appalachian music is derived primarily from the English and Scottish ballad tradition and Irish and Scottish fiddle music. African-American blues musicians played a significant role in developing the instrumental aspects of Appalachian music, most notably with the introduction of the banjo— one of the region's iconic symbols— in the late 18th century. In the years following World War I, British folklorist Cecil Sharp brought attention to Southern Appalachia when he noted that its inhabitants still sang hundreds of English and Scottish ballads that had been passed down to them from their ancestors. Commercial recordings of Appalachian musicians in the 1920s would have a significant impact on the development of country music, bluegrass, and old-time music. Appalachian music saw a resurgence in popularity during the American folk music revival of the 1960s, when musicologists such as Mike Seeger, John Cohen, and Ralph Rinzler traveled to remote parts of the region in search of musicians unaffected by modern music. Today, dozens of annual music festivals held throughout the region preserve the Appalachian music tradition. Early Appalachian literature typically centered on the observations of people from outside the region, such as Henry Timberlake's Memoirs (1765) and Thomas Jefferson's Notes on the State of Virginia (1784), although there are notable exceptions, including Davy Crockett's A Narrative of the Life of Davy Crockett (1834). Travellers' accounts published in 19th-century magazines gave rise to Appalachian local color, which reached its height with George Washington Harris's Sut Lovingood character of the 1860s and native novelists such as Mary Noailles Murfree. Works such as Rebecca Harding Davis's Life in the Iron Mills (1861), Emma Bell Miles' The Spirit of the Mountains (1905), and Horace Kephart's Our Southern Highlanders (1913) marked a shift in the region's literature from local color to realism. The transition from an agrarian society to an industrial society and its effects on Appalachia are captured in works such as Olive Tilford Dargan's Call Home to the Heart (1932), James Still's The River of Earth (1940), Harriette Simpson Arnow's The Dollmaker (1954), and Harry Caudill's Night Comes to the Cumberlands (1962). In the 1970s and 1980s, the rise of authors like Cormac McCarthy, Breece D'J Pancake, Dorothy Allison, and Lisa Alther brought greater literary diversity to the region. Along with the above-mentioned, some of Appalachia's best known writers include: James Agee (A Death in the Family), Anne W. Armstrong (This Day and Time), Wendell Berry (Hannah Coulter, The Unforeseen Wilderness: An Essay on Kentucky's Red River Gorge, Selected Poems of Wendell Berry), Jesse Stuart (Taps for Private Tussie, The Thread That Runs So True), Denise Giardina (The Unquiet Earth, Storming Heaven), Lee Smith (Fair and Tender Ladies, On Agate Hill), Silas House (Clay's Quilt, A Parchment of Leaves), Wilma Dykeman (The Far Family, The Tall Woman), Maurice Manning (Bucolics, A Companion for Owls), Anne Shelby (Appalachian Studies, We Keep a Store), George Ella Lyon (Borrowed Children, Don't You Remember? ), Pamela Duncan (Moon Women, The Big Beautiful), Chris Offutt (No Heroes, The Good Brother), Charles Frazier (Cold Mountain, Thirteen Moons), Sharyn McCrumb (The Hangman's Beautiful Daughter), Robert Morgan (Gap Creek), Jim Wayne Miller (The Brier Poems), Gurney Norman (Divine Right's Trip, Kinfolks), Ron Rash (Serena), Elizabeth Madox Roberts ("The Great Meadow, "The Time of Man"), Thomas Wolfe (Look Homeward Angel, You Can't Go Home Again), Rachel Carson (The Sea Around Us, Silent Spring; Presidential Medal of Freedom), and Jeannette Walls (The Glass Castle). Appalachian folklore has a strong mixture of European, Native American (especially Cherokee), and Biblical influences. The Cherokee taught the region's early European pioneers how to plant and cultivate crops such as corn and squash and how to find edible plants such as ramps. The Cherokee also passed along their knowledge of the medicinal properties of hundreds of native herbs and roots, and how to prepare tonics from such plants. Before the introduction of modern agricultural techniques in the region in the 1930s and 1940s, many Appalchian farmers followed the Biblical tradition of planting by "the signs," such as the phases of the moon, or when certain weather conditions occurred. Appalachian folk tales are rooted in English, Scottish, and Irish fairy tales, as well as regional heroic figures and events. Jack tales, which tend to revolve around the exploits of a simple-but-dedicated figure named "Jack," are popular at story-telling festivals. Other stories involve wild animals, such as hunting tales. Regional folk heroes such as the railroad worker John Henry and frontiersman Davy Crockett are examples of real-life figures that evolved into popular folk tale subjects. Murder stories, such as Omie Wise and John Hardy, are popular subjects for Appalachian ballads. Ghost stories, or "haint tales" in regional English, are a common feature of southern oral and literary tradition. Ghost stories native to the region include the story of the Greenbrier Ghost, which is rooted in a Greenbrier County, West Virginia murder. In the 1940s through the 60s, Wheeling, West Virginia became a cultural center of the region because it had a clear-channel AM radio station WWVA, which could be heard throughout the entirety of eastern USA at night. Although stations such as Pittsburgh's KDKA and KQV were 50 kilowatt clear channels that dated back to the early 1920s (as well as spanning all the east coast in signal strength), WWVA prided itself on rural and farm programming that appealed to a wider audience in the rural region. While the climate of the Appalachian region is suitable for agriculture, the region's hilly terrain greatly limits the size of the average farm, a problem exacerbated by population growth in the latter half of the 19th century. Subsistence farming was the backbone of the Appalachian economy throughout much of the 19th century, and while economies in places such as Western Pennsylvania, the Great Valley of Virginia, and the upper Tennessee Valley in East Tennessee, transitioned to a large-scale farming or manufacturing base around the time of the Civil War, subsistence farming remained an important part of the region's economy until the 1950s. In the early 20th-century, Appalachian farmers were struggling to mechanize, and abusive farming practices had over the years left much of the already-limited farmland badly eroded. Various federal entities intervened in the 1930s to restore damaged areas and introduce less-harmful farming techniques. In recent decades, the concept of sustainable agriculture has been applied to the region's small farms, with some success. Nevertheless, the number of farms in the Appalachian region continues to dwindle, plunging from 354,748 farms on 47 million acres (19 million hectares) in 1969 to 230,050 farms on 35 million acres (14 million hectares) in 1997. Early Appalachian farmers grew both crops introduced from their native Europe (such as sweet potatoes) as well as crops native to North America (such as corn and squash). Tobacco has long been an important cash crop in Southern Appalachia, especially since the land is ill-suited for cash crops such as cotton. Apples have been grown in the region since the late 18th-century, their cultivation being aided by the presence of thermal belts in the region's mountain valleys. Hogs, which could free range in the region's abundant forests, were the most popular livestock among early Appalachian farmers. The early settlers also brought cattle and sheep to the region, which they would typically graze in highland meadows known as balds during the growing season when bottomlands were needed for crops. Cattle, mainly the Hereford, Angus, and Charolais breeds, are now the region's chief livestock. Coal mining is the industry most frequently associated with Appalachia in outsiders' minds, due in part to the fact that the region once produced two-thirds of the nation's coal. At present, however, the mining industry employs just 2% of the Appalachian workforce. The region's vast coalfield covers 63,000 square miles (160,000 km2) between northern Pennsylvania and central Alabama, mostly along the Cumberland Plateau and Allegheny Plateau regions. Most mining activity has been concentrated in Eastern Kentucky, Southwestern Virginia, West Virginia, and Western Pennsylvania, with smaller operations in Western Maryland, Tennessee and Alabama. The Pittsburgh coal seam, which has produced 13 billion tons of coal since the early 19th century, has been called the world's most valuable mineral deposit. There are over 60 major coal seams in West Virginia, and over 80 in Eastern Kentucky. Most of the coal mined is bituminous coal, although significant anthracite deposits exist on the fringe of the region in central Pennsylvania. About two-thirds of Appalachia's coal is produced by underground mining, the rest by surface mining. Mountaintop removal, a form of surface mining, is a highly controversial mining practice in central Appalachia due to its negative impacts on the environment. Coal mining has made a comeback in some regions in the early 21st century as an alternative energy source as well as the increased prominence of CONSOL Energy, based in Pittsburgh. The Quecreek Mine Rescue in 2002 and continuing mine subsidence problems in abandoned coal mines in Western Pennsylvania and other regions have also been highlighted in recent times. One of the region's oldest industries, tourism became a more important part of the Appalachian economy in the latter half of the 20th century as mining and manufacturing steadily declined. In 2000-2001, tourism in Appalachia accounted for nearly $30 billion and over 600,000 jobs. The mountain terrain— with its accompanying scenery and outdoor recreational opportunities— provide the region's primary attractions. The region is home to one of the world's most well-known hiking trails (the Appalachian Trail), the nation's most-visited national park (the Great Smoky Mountains National Park), and the nation's most visited national parkway (the Blue Ridge Parkway). The craft industry, including the teaching, selling, and display or demonstration of regional crafts, also accounts for an important part of the Appalachian economy, bringing (for example) over $100 million annually to the economy of Western North Carolina and over $80 million to the economy of West Virginia. Important heritage tourism attractions in the region include the Biltmore Estate and the Eastern Band of the Cherokee reservation in North Carolina, Cades Cove in Tennessee, and Harpers Ferry in West Virginia. Important theme parks include Dollywood and Ghost Town in the Sky, both on the periphery of the Great Smoky Mountains. The mineral-rich mountain springs of the Appalachians— which for many years were thought to have health-restoring qualities— were drawing visitors to the region as early as the 18th century with the establishment of resorts at Hot Springs, Virginia and what is now Hot Springs, North Carolina. Along with the mineral springs, the cool and clear air of the range's high elevations provided an escape for lowland elites, and elaborate hotels— such as the Greenbrier in West Virginia and the Balsam Mountain Inn in North Carolina— were built throughout the region's remote valleys and mountain slopes. The end of World War I (which opened up travel opportunities to Europe) and the arrival of the automobile (which changed the nation's vacation habits) led to the demise of all but a few of the region's spa resorts. The establishment of national parks in the 1930s brought an explosion of tourist traffic to the region, but created problems with urban sprawl in the various host communities. In the late 20th and early 21st centuries, states have placed greater focus on sustaining tourism while preserving host communities. Poverty had plagued Appalachia for many years but was not brought to the attention of the rest of the United States until 1960, by US President John F. Kennedy, who proceeded to establish the President's Appalachian Regional Commission in 1963. His successor, President Lyndon B. Johnson, crystallized Kennedy's efforts in the form of the Appalachian Regional Commission, which passed into law in 1965. Since the creation of the Appalachian Regional Commission (ARC) in 1965, the region has seen dramatic progress. New roads, schools, health care facilities, water and sewer systems, and other improvements have brought a better life to many Appalachian residents. In the 1960s, 219 counties in the 13-state Appalachian Region were considered economically distressed. Now that list has been cut in half, to 82 counties, but these are "hard-core" pockets of poverty, seemingly impervious to all efforts at improving their lot. Martin County, Kentucky, the site of Johnson’s 1964 speech, is one such county still ranked as "distressed" by the ARC. As of 2000, the per capita income in Martin County was $10,650, and 37% of its residents lived below the poverty line. The ARC's geographic range of coverage was defined broadly so as to cover as many economically underdeveloped areas as possible; it extends well beyond the area usually thought of as "Appalachia". For instance, parts of Alabama and Mississippi were included in the commission because of problems with unemployment and poverty similar to those in Appalachia proper, and the ARC region extends into Northeastern states, which are never considered part of Appalachia culturally. More recently, the Youngstown, Ohio region was declared part of Appalachia by the ARC due to the collapse of the steel industry in the region in the early 1980s and the continuing unemployment problems in the region since, though aside from Columbiana County, Ohio the Youngstown DMA isn't traditionally or culturally considered part of the region. The ARC's wide scope also grew out of the "pork barrel" phenomenon, as politicians from outside the traditional Appalachia area saw a new way to bring home federal money to their areas. Transportation has been the most challenging and expensive issue in Appalachia since the arrival of the first European settlers in the 18th century. Until major federal intervention in the 1960s, the region's mountainous terrain continuously thwarted attempts at major road construction, leaving large parts of the region virtually isolated and slowing economic growth. Before the Civil War, major cities in the region were connected via wagon roads to lowland areas, and flatboats provided an important means for transporting goods out of the region. By 1900, railroads connected most of the region with the rest of the nation, although the poor roads made travel beyond railroad hubs difficult. When the Appalachian Regional Commission was created in 1965, road construction was considered its most important initiative, and in subsequent decades the commission spent more on road construction than all other projects combined. The effort to connect Appalachia with the outside world has required numerous civil engineering feats. Millions of tons of rock were removed to build road segments such as Interstate 40 through the Pigeon River Gorge at the Tennessee-North Carolina state line and U.S. Route 23 in Letcher County, Kentucky. Large tunnels were built through mountain slopes at Cumberland Gap to speed up travel along U.S. Route 25E. 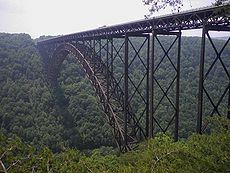 The New River Gorge Bridge in West Virginia, completed in 1977, is the second-longest single-arch bridge in the world. The Blue Ridge Parkway's Linn Cove Viaduct, the construction of which required the assembly of 153 pre-cast segments 4,000 feet (1,200 m) up the slopes of Grandfather Mountain, has been designated a historic civil engineering landmark. The motion pictures Coal Miner's Daughter (based on the life of noted country singer Loretta Lynn), Where the Lilies Bloom and Songcatcher (see also "Songcatcher" below) attempt an accurate portrayal of life in Appalachia. Songcatcher (2000) - written and directed by Maggie Greenwald, starring Aiden Quinn and Emmy Rossum. The film takes place in rural Appalachia in 1907 and features the "lost" ballads of the Scots-Irish brought over in the 19th century and a musicologists' quest to preserve them. The Appalachian town of Big Stone Gap, Virginia has been the setting of several best-selling novels, including The Trail of the Lonesome Pine by John Fox, Jr. and the Big Stone Gap series by Adriana Trigiani. Country Boys is a documentary film by David Sutherland showing three years in the lives of two teenagers growing up in eastern Kentucky. Homer Hickam's book Rocket Boys and its movie adaptation October Sky are slightly fictionalized versions of his childhood and teenage years in Coalwood, a coal camp in Southern West Virginia. The 1972 film Deliverance takes place in southern Appalachia. The film is often held responsible for perpetuating negative stereotypes of the region. The 1987 film Matewan fictionalizes a real-life clash between West Virginia coal miners, supported by union organizers, and coal companies in the 1920s. Scenes depicting the town were actually shot in Thurmond, West Virginia. Large-format photographer Shelby Lee Adams, himself a son of Appalachian emmigrants, has portrayed the Appalachian family life sympathetically in several books. Composer Aaron Copland composed music for a ballet called Appalachian Spring. Composer Frederick Delius wrote a theme and variations entitled Appalachia, and Alan Hovhaness wrote a tone poem named To the Appalachian Mountains (Symphony no. 60). Kopple, Barbara (Director). Harlan County, USA [documentary film]. Harlan County, Kentucky: Cabin Creek Productions. Author Catherine Marshall wrote Christy, loosely based on her mother's years as a teacher in the Appalachian region. This became the basis of a short-lived television series of the same name in 1994. The book Prodigal Summer by Barbara Kingsolver explores the ecology of the region and how the removal of the predators, wolves and coyotes, has affected the environment. The book "Rough Lumber: Stories from Spurlock Creek," by Justine Felix Rutherford, describes growing up in rural West Virginia during the Great Depression. In The Hunger Games by Suzanne Collins, a dystopian work of young adult literature, readers are told that District 12 is located in a region that used to be known as Appalachia. The chief occupation of people from this district is coal mining. Josiah Leming, singer/songwriter, born and raised in Morristown, Tennessee has a song entitled "Appalachia." The fictional television program, "Justified," is set in the eastern hills of Kentucky in and around Harlan County. ^ a b "Appalachian Region". Appalachian Regional Commission. http://www.arc.gov/index.do?nodeId=2. Retrieved 2008-11-27. ^ a b c d e f Rudy Abramson, Introduction to Encyclopedia of Appalachia (Knoxville, Tenn.: University of Tennessee Press, 2006), pp. xix—xxv. ^ a b c John Alexander Williams, Appalachia: A History (Chapel Hill, N.C.: University of North Carolina Press, 2002), pp. 11-14. ^ Walls, David (1977), "On the Naming of Appalachia," In An Appalachian Symposium, pp. 56-76. ^ Walls, David (2006). "Appalachia." The Encyclopedia of Appalachia (Knoxville, Tenn.: University of Tennessee Press), pp. 1006-1007. ^ Charles Hudson, The Juan Pardo Expeditions: Explorations of the Carolinas and Tennessee, 1566-1568 (Tuscaloosa, Ala.: University of Alabama Press, 2005), p. 17. ^ a b Williams, Appalachia: A History, pp. 30-44. ^ Caudill, Night Comes to the Cumberlands, pp. 7-13, 19. ^ a b Richard Drake, A History of Appalachia (Lexington, Kentucky: University Press of Kentucky, 2001), pp. 59-69. ^ John Alexander Williams, Appalachia: A History, pp. 64-68. ^ John Alexander Williams, Appalachia: A History, pp. 118-9. ^ a b c Gordon McKinney, "The Civil War." Encyclopedia of Appalachia (Knoxville, Tenn.: University of Tennessee Press, 2006), pp. 1579-1581. ^ a b John Alexander Williams, Appalachia: A History, pp. 160-165. ^ Curry, Richard O. A House Divided, Statehood Politics & the Copperhead Movement in West Virginia, Univ. of Pittsburgh Press, 1964, pgs. 141-147. Twenty-four of the most mountainous counties of West Virginia voted for the Secession Ordinance on May 23, 1861. ^ Caudill, Night Comes to the Cumberlands, pp. 39-45. ^ Drake, A History of Appalachia, 131-141. ^ a b John Alexander Williams, Appalachia: A History, pp. 187-193. ^ a b Drake, A History of Appalachia, pp. 200-210. ^ John Alexander Williams, Appalachia: A History, pp. 310-312. ^ "ARC-Designated Distressed Counties, Fiscal Year 2010". Appalachian Regional Commission. http://www.arc.gov/appalachian_region/ARCDesignatedDistressedCountiesFiscalYear2010.asp. Retrieved August 17, 2010. ^ David Newhall, "English." Encyclopedia of Appalachia (Knoxville, Tenn.: University of Tennessee Press, 2006), pp. 253-255. ^ a b David Hackett Fischer, Albion's Seed: Four British Folkways in America (New York: Oxford University Press, 1989), pp. 620-630. ^ Bruce Betler, "Swiss." Encyclopedia of Appalachia (University of Tennessee Press, 2006), pp. 281-282. ^ Dwight Billings and Kathleen Blee, "African-American Families and Communities." Encyclopedia of Appalachia (Knoxville, Tenn.: University of Tennessee Press, 2006), pp. 155-156. ^ Howard Dorgan, Introduction to the "Religion" section, Encyclopedia of Appalachia (Knoxville, Tenn.: University of Tennessee Press, 2006), pp. 1281-1289. ^ a b Clifford Grammich, "Baptists, the Old-Time Groups." Encyclopedia of Appalachia (Knoxville, Tenn.: University of Tennessee, 2006), pp. 1298-1300. ^ Conrad Ostwalt, "Presbyterian, Denominational Family." Encyclopedia of Appalachia (Knoxville, Tenn.: University of Tennessee Press, 2006), pp. 1342-1344. ^ Heather Ann Ackley Bean, "Methodists." Encyclopedia of Appalachia (Knoxville, Tenn.: University of Tennessee Press, 2006), pp. 1330-1332. ^ Stanley Burgess, Patrick Alexander, and Gary McGee, "Pentecostals." Encyclopedia of Appalachia (Knoxville, Tenn.: University of Tennessee Press, 2006), pp. 1336-1339. ^ Harvey Neufeldt, "Mennonites." Encyclopedia of Appalachia (Knoxville, Tenn.: University of Tennessee Press, 2006), pp. 1327-1329. ^ Michael Montgomery, Language — Introduction, The Encyclopedia of Appalachia (Knoxville, Tenn.: University of Tennessee Press, 2006), pp. 999-1004. ^ a b Alan DeYoung, Introduction to Education section, Encyclopedia of Appalachia (Knoxville, Tenn.: University of Tennessee Press, 2006), pp. 1517-1521. ^ Ted Olson, "Music — Introduction". Encyclopedia of Appalachia (Knoxville, Tenn.: University of Tennessee Press, 2006), pp. 1109—1120. ^ Grace Toney Edwards, "Literature — Introduction," Encyclopedia of Appalachia (Knoxville, Tenn.: University of Tennessee Press, 2006), pp. 1035-1039. ^ a b c d Deborah Thompson and Irene Moser, "Appalachian Folklife." A Handbook to Appalachia: An Introduction to the Region (Knoxville, Tenn.: University of Tennessee Press, 2006), pp. 143-156. ^ a b Michael Best and Curtis Wood, Introduction to the Agriculture section in the Encyclopedia of Appalachia (Knoxville, Tenn.: University of Tennessee Press, 2006), pp. 395-402. ^ a b c Linda Daily Paulson, "Lumber Industry." Encyclopedia of Appalachia (Knoxville, Tenn.: University of Tennessee Press, 2006), pp. 501-504. ^ Vic Weals, The Last Train to Elkmont (Knoxville, Tenn.: Olden Press, 1993), pp. 1-8. ^ a b c Rudy Abramson, "Bituminous Coal Industry." Encyclopedia of Appalachia (Knoxville, Tenn.: University of Tennessee Press, 2006), pp. 457-460. ^ "U.S. Coal Production by State, Region and Method of Mining - 2007" (PDF). National Mining Association. http://www.nma.org/pdf/c_production_method.pdf. ^ "Profile of the U.S. Coal Miner - 2007" (PDF). National Mining Association. http://www.nma.org/pdf/c_profile.pdf. ^ "U.S. Coal Mine Employment by State, Region and Method of Mining - 2007" (PDF). National Mining Association. http://www.nma.org/pdf/c_employment_state_region_method.pdf. ^ a b Jack Hurst, Introduction to Business, Technology, and Industry section, Encyclopedia of Appalachia (Knoxville, Tenn.: University of Tennessee, 2006), pp. 441-447. ^ Janice Willis Barnett, "Aluminum Industry," Encyclopedia of Appalachia (Knoxville, Tenn.: University of Tennessee Press, 2006), pp. 449-451. ^ Martha Avaleen Egan, "Chemical Industry," Encyclopedia of Appalachia (Knoxville, Tenn.: University of Tennessee, 2006), pp. 468-471. ^ Daniel Varat, "Champion Fibre," Encyclopedia of Appalachia (Knoxville, Tenn.: University of Tennessee Press, 2006), pp. 466-467. ^ a b c Benita Howell, "Tourism." Encyclopedia of Appalachia (Knoxville, Tenn.: University of Tennessee Press, 2006), pp. 611-616. ^ Economic Effects of Tourism in Appalachia. Appalachian Regional Commission Online Resource Center. Retrieved: 7 August 2009. ^ Great Smoky Mountains National Park. Official site. Retrieved: 7 August 2009. ^ Blue Ridge Parkway. Official site. Retrieved: 7 August 2009. ^ Appalachian Regional Commission Tourism Council, Roadmap for Tourism & Craft. July 2003. Retrieved: 7 August 2009. ^ Jackson, David (2008-04-23). "McCain's economics talk follows LBJ path". USA Today. http://www.usatoday.com/news/politics/election2008/2008-04-23-mccain-ky_N.htm. ^ "United States Code Title 40 Subtitle IV - Appalachian Regional Development". Appalachian Regional Commission. http://www.arc.gov/about/USCodeTitle40SubtitleIV.asp. Retrieved September 23, 2010. ^ Earl Dotter, "Coalfield Generations: Health, Mining and the Environment" Southern Spaces, 16 July 2008. ^ "Counties in Appalachia". Appalachian Regional Commission. http://www.arc.gov/index.do?nodeId=27. Retrieved 2008-08-22. ^ a b Mark Burton and Richard Hatcher, Introduction to Transportation section, Encyclopedia of Appalachia (Knoxville, Tenn.: University of Tennessee Press, 2006), pp. 685-690. ^ "Designated Historic Civil Engineering Landmarks". American Society of Civil Engineers. http://www.asce.org/history/landmark/search.cfm. Retrieved 2009-09-14. Becker, Jane S. Inventing Tradition: Appalachia and the Construction of an American Folk, 1930-1940 (1998). Biggers, Jeff (2006). The United States of Appalachia: How Southern Mountaineers Brought Independence, Culture and Enlightenment to America (New ed.). Shoemaker and Hoard. ISBN 1593760310. Dawley, Jr., Thomas R. (March 1910). "Our Southern Mountaineers: Removal The Remedy For The Evils That Isolation And Poverty Have Brought". The World's Work: A History of Our Time XIX: 12704–12714. Retrieved on 2009-07-10. Dotter, Earl. "Coalfield Generations: Health, Mining and the Environment" Southern Spaces, 16 July 2008. Sarnoff, Susan (2003). "Central Appalachia – Still the Other America". Journal of Poverty 7 (1 & 2): 123–139. DOI:10.1300/J134v07n01_06. "Space, Place, and Appalachia", Southern Spaces, 3 June 2009. This page uses content from the English language Wikipedia. The original content was at Appalachia. The list of authors can be seen in the page history. As with this Familypedia wiki, the content of Wikipedia is available under the Creative Commons License.